Watercolor Illustration - "Letting Go of Control"
What do you think is the main idea of the article just based on the title? What do you think the author will elude to? Describe what the author experiences throughout this article. How has the author grown from the experiences she had with her daughter? What are 3 key points you've learned from the article/blog? What is your opinion of the idea of "letting go of control over your art"? Describe a time where you had to "let go of control" and because of it changed you in some way. 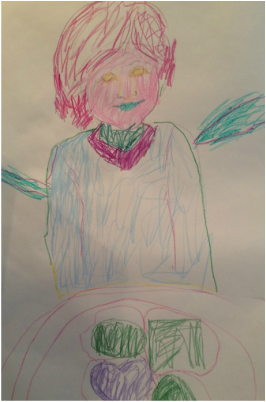 While taking inspiration from Hendrick's discoveries while working through "letting go of control" herself, your challenge is to start a detailed drawing of the subject of your choice and find a 4-6 year old child to add to it. Your starter drawing should represent your ability; add detail, shading and value, contrast, proportion...all those things that make for good design. You may the medium of your choice. Do not coax, hint at, give suggestions to, or tell the child what to do as far as what they should draw or create. LET GO OF YOUR CONTROL!!! The only suggestion you are allowed to make is this: ask the child to do the best job they can. That's it! Now that the child has drawn on your drawing, your job is to add to it the most detail, color, texture, and embellishment you can to refine and resolve the composition. What to do if your little cherub doesn't cooperate!!! The other day I had the privilege of meeting, our beloved teacher and colleague, Per Lee's wonderful family when I went to his home to help with a construction project. His super cool 4 year old daughter, Mckenna, wanted to show me her drawings because she knew I was an Art teacher. 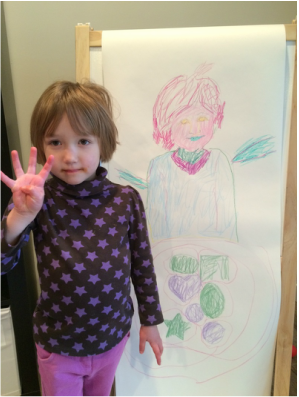 I asked her if I could draw her picture. She agreed. I then asked her to finish my drawing by adding legs and arms and other embellishments. Here is what Mckenna came up with?